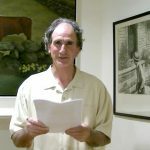 John Maloney's recent poem about the Island's six towns was written for the annual fundraiser for the Martha's Vineyard Museum. 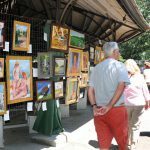 The 53rd annual All Island Art Show opens Monday August 1, with original are circling the Tabernacle in the Oak Bluffs Campgrounds. 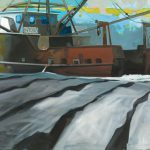 Shephard Fine ArtSpace is featuring the oil paintings of Rez Williams, known for his striking paintings of New Bedford fishing boats. Vineyard Artisans Festival 10 am–2 pm, Grange Hall, West Tisbury. 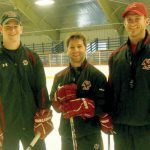 Three members of the Boston College Eagles Ice Hockey team came to the Vineyard to conduct a clinic for the MV Mites and Squirts last weekend. Four of the 765 stalwarts who completed the Third Nantucket Sprint Triathlon, Saturday, were Vineyarders. Tuesday was make up night for the Women's Softball League at Tisbury's War Veterans Memorial Park. 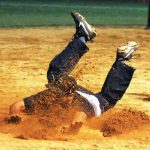 In the Men's Summer Softball League Monday triple header, the Hurricanes ran away from the Treds, literally, 30-4. 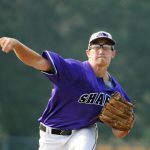 Hero of the day, again, was the Sharks leadoff batter, Robbie Zinsmeister of Indiana University of Pennsylvania. 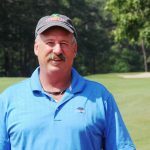 Elmer Silva of Tisbury defeated Gary BenDavid of Oak Bluffs, 4 and 3 in the Championship Flight at the Farm Neck Golf Club's Championship tournament, last weekend. Watching all the consternation about funding for everything from towns to charities, my observations always end up with the same question. 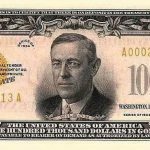 March 6, 2012 will mark the fifteenth anniversary of the death of Robert W.
This is Thursday, so maybe the debt crisis has been solved. I would love to talk about how Lisa Scannell, known to many as Lisa BenDavid, is a dedicated member of the Martha's Vineyard equine community, about how her passion and discipline is contagious, or how knowledge of all things horse-related is never ending. I had the pleasure and honor to have known Roger Ross and worked with him house painting for six years. As I looked about, while passing time on a recent ferry crossing, I couldn't help but notice one of the returning Island sports teams, not enthused and reveling over their recent victory, but to almost a person, engrossed in silent communication on their cellular phones. On July 19, while visiting my uncle in Vineyard Haven, I slipped as I was transferring from a chair to my wheelchair and slid to the floor.